I remember teaching the Retiform technique over 8 years ago at an AC Moore in North Carolina - yikes, that's a long time ago! I haven't really favored the technique and was unsure about today's blog hop...until I saw a video tutorial by Heather Scott about a "Modified Retiform" technique. And that's what I did here - which I love! You have 5 days to play along and there will be some prizes awarded at the end! I tell you, I am having so much fun this week! I know it's going to be a great month and I hope you will find time to play along...If you are unsure of how to do this Retiform technique, there are some great tutorials online at the Savvy Projects Blog to help you get started! Beautil color choices, and paper selection. It all works! It looks great Chris! I think I like the modified version better too! Very nice Chris! Love the colors! 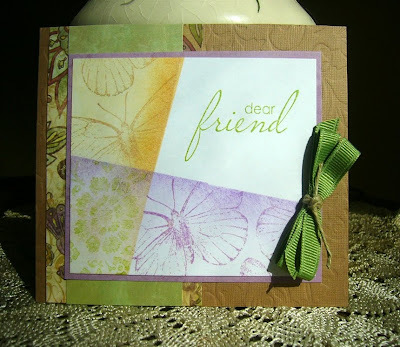 Very pretty - love the colors you used, soft and relaxing. What a great fried card, I woud love to get a card like this. Such pretty colors. What a lovely card! Wonderful Chris! Love your color palette and design! I totally love your card--the layout is unique! Very pretty! Clean, stylish and totally fantastic! oh I love your card. GREAT job. Love all the texture in the cardstock. Stunning Chris - my favorite color combination. Beautifully done. gorgeous! Love the softness feel of this card! what a beautiful card - love the colors - great modified retiform. I'm definitely going to have to try this too! This is so pretty, love the colors and the images you used are great!